Below is the essay from Chapter 3 of the Foresight Africa 2018 report, which explores six overarching themes that provide opportunities for Africa to overcome its obstacles and spur inclusive growth. Download the paper to see the contributing viewpoints from high-level policymakers and other Africa experts. You can also join the conversation using #ForesightAfrica. Pour lire ce chapitre en Français, cliquez ici. why has africa’s fast economic growth left more poor people behind and how do we fix it? Despite Africa’s robust economic growth from 2000 to 2015,1 the absolute number of poor has increased on the continent. The World Bank estimates that Africa had at least 50 million more poor people in 2013 compared to 1990,2 and Homi Kharas and Wolfgang Fengler estimate that at least 2.4 million of new poor were added in 2017 alone.3 Even the fastest-growing countries have not always translated growth into significant poverty reduction. 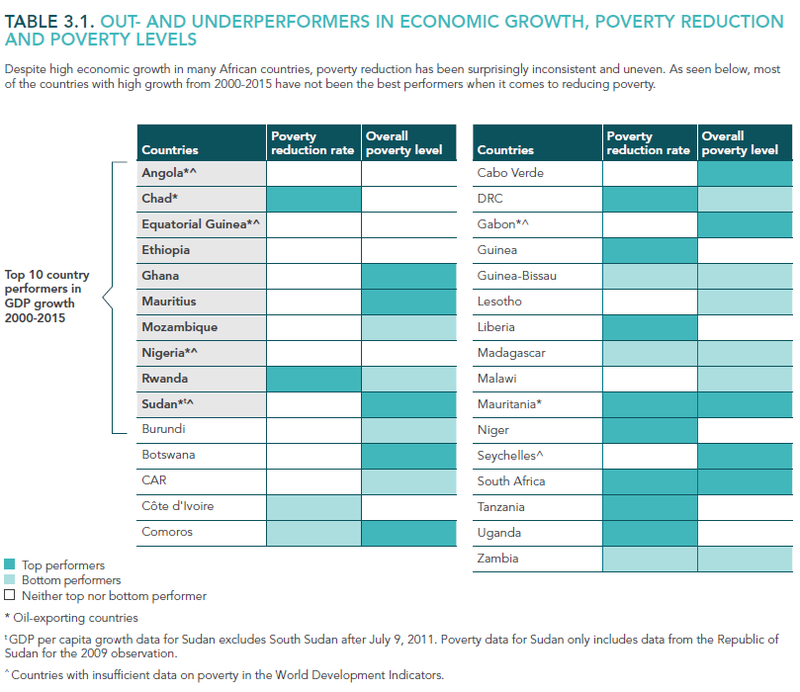 For example, as seen in Figure 1, only two of Africa’s top 10 fastest-growing countries are also among the top 10 outperformers in terms of poverty reduction rate (Rwanda and Chad) and of overall poverty levels (Mauritius and Sudan). 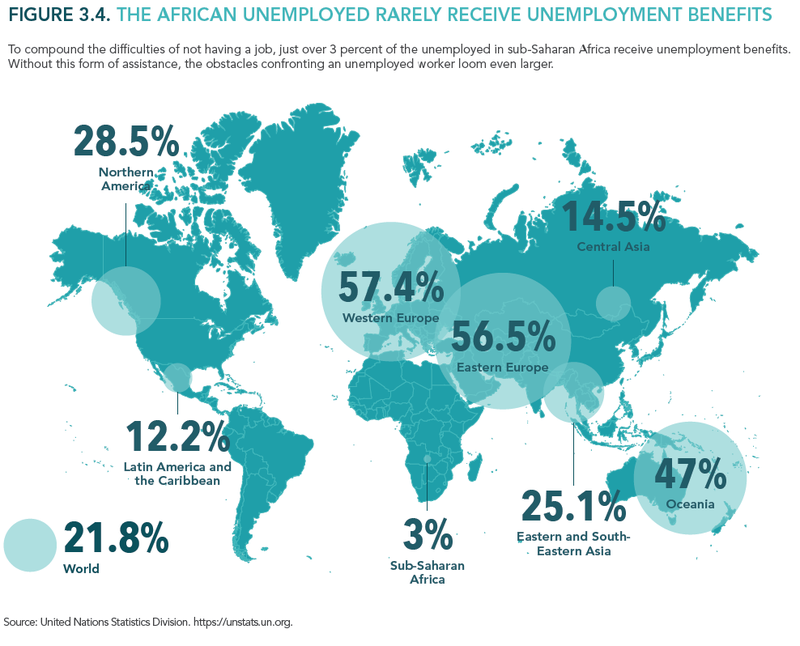 This essay explores three factors explaining the disconnect between African growth and poverty reduction, and provides some policy recommendations to broaden the benefits of growth going forward. Although the literature on the question provides a broad variety of factors, I focus on three of the most prominent ones: non-labor-intensive driven economic growth (growth without quality job creation), the fast demographic growth in a context of deep poverty, and limited or ineffective pro-poor policy interventions and governance. Additionally, the majority of the top 10 fastest-growing economies from 2000 to 2015 were resource-rich, mostly oil exporters (Equatorial Guinea, Nigeria, Chad, Sudan, Angola) with growth mostly driven by these natural resources.5 Labor-intensive sub-sectors have not evolved fast enough to generate quality employment growth. This potentially catastrophic situation is partly explained by its initial conditions, many countries starting from a very low level of poverty and vulnerable employment, in addition to the deteriorations resulting from conflict-ridden and fragile states. In order to stimulate quality employment growth, governments should develop policies aimed to achieve economic structural transformation through diversification and development of labor-intensive sectors. Policymakers should identify the labor-intensive sectors for which they have a sustainable competitive advantage (manufacturing, industrial development, agriculture and agri-processing, tourism, etc. ), and create clusters in order to enable the private sector to strive and facilitate the creation of well-paid and sustainable jobs. Amadou Sy has discussed solutions, including well-designed agricultural policies, increased productivity, transformation, and export of agricultural products.6 John Page examines these strategies in depth in Chapter 5 of this publication. Achieving diversification and job creation will also require addressing other considerations, especially in fragile countries, such as improving human capital (quality education and health systems to support capable, healthy, and skilled workers), reducing the cost of doing business (including infrastructure, security, property rights, etc. ), facilitating access to finance, easing trade restrictions, shifting away the dependence to natural resources, and providing tax incentives for job-creating businesses, among others. Africa’s rapid population growth, in a context where poverty levels are already profoundly high, is one of the main causes explaining the increased number of poor on the continent despite the fast economic growth. As noted by Laurence Chandy, the average poverty reduction rate is lower than the average population growth, which logically results in an increase of the number of poor despite the decrease of the proportion of poor people.7 In fact, the World Bank notes that the proportion of people living below poverty line has decreased from 55 percent in 1990 to 43 percent in 2012, but with the fast population growth, the absolute number of poor people increased.8 For example, nine of the top 10 economic outperformers in Africa have a high fertility rate (4-5 births or above per woman). The depth of poverty is also a contributing factor. At 16 percent, the regional poverty gap is five times higher than South Asia’s, which means that the African poor are extremely poor.9 As such, incremental improvements in the levels of income are not sufficient to push households above the poverty line. Combining the depth of poverty with the high fertility rate makes it more challenging to pull populations out of poverty. To make growth more effective at reducing poverty, policymakers should develop and implement policies aiming to control population growth so that the poverty reduction rate grows faster than the population while also enhancing well-paid employment opportunities. This task is particularly important as 70 percent of the population in sub-Saharan Africa is below the age of 3010 and the poverty rate among youth is also 72 percent.11 In addition, the unemployment rate is likely to be twice higher for the current youth when they enter the labor force.12 Promoting family planning, particularly in countries with rapid demographic growth, should be an important component of policies to achieve inclusive growth and shared prosperity. With the demographic boom and in absence of quality employment growth, the poor populations are often left alone, facing serious risks and vulnerabilities (food insecurity, epidemics, pandemics, infant and maternal mortality, gender gap, education, etc.). For example, 695 million people are living without basic sanitation access, only 34 percent have access to roads,13 and 620 million people don’t have access to electricity (sub-Saharan Africa).14 In 2014-2015, 153 million people over 15 years of age suffered from severe food insecurity in sub-Saharan Africa.15 Africa also faces the highest challenges in terms of social protection, especially related to health access.16 Africa, especially sub-Saharan Africa, is also the region of the world with the highest proportion of workers living below the poverty line. Most vulnerable people do not necessarily have access to social assistance. The situation is worse in fragile and conflict-affected states, as civil war, terrorism, and political instability cause countries to lose decades of poverty reduction progress. 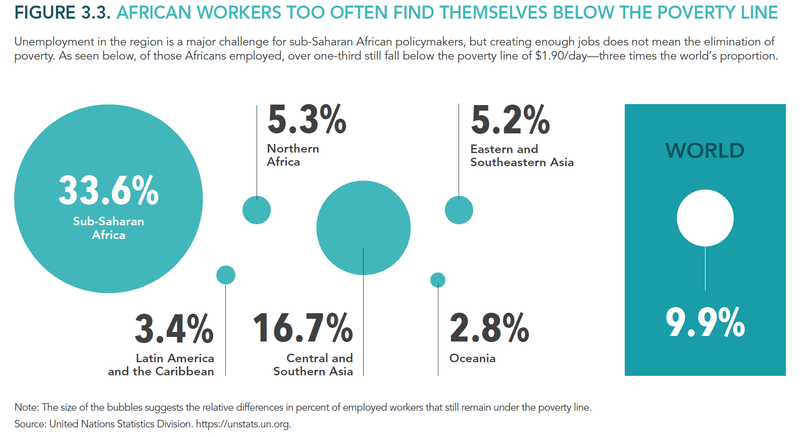 As achieving employment growth through structural transformation takes time, policymakers should simultaneously develop targeted policies, including with cash transfers,17 to improve immediate poverty alleviation. Policymakers should adopt, through social protection initiatives, targeted interventions addressing immediate needs (poverty reduction, education, health, food, security, etc.) through four mechanisms. First, policymakers should make direct transfers (social assistance) to extremely poor individuals in order to increase their income and reduce vulnerability. These non-contributory, predictable, and regular transfers constitute the most direct route to address the thorny issues of poverty and, possibly, a more efficient way to share natural resource wealth. (Shanta Devarajan discusses universal basic income in a Viewpoint in this chapter.) Second, a better system of social insurance should be developed, with mandatory contributions from all workers, so that they can benefit in case of income shocks due to injury, illness, unemployment, retirement, or old age. Now, even where such programs exist, they are not efficiently implemented, and too often, workers are left alone. Third, policymakers should adopt, but most importantly, enforce high labor standards to protect the rights of workers, to shift away from employment vulnerability. Finally, specific social services must be developed for some of the most vulnerable groups who do not fall into previous categories, including children, women, elders, and people living in remote rural areas, among others. Government should gather reliable information and develop policy interventions aiming at fixing the immediate needs. All in all, African policymakers should keep the continent’s growth momentum, but keep reducing poverty a center of focus. They should act now, not later, to make growth more inclusive and leave no one behind. My forthcoming book discusses the role of institutions in shaping Africa’s political and economic transformation. Landry Signé. 2018. African Development, African Transformation: How Institutions Shape Development Strategy. Cambridge: Cambridge University Press. New players in the oil and gas sectors, which are also outperformers, include Ghana and Mozambique. Chandy, Laurence. 2016. Why Is the Number of Poor People in Africa Increasing When Africa’s Economies Are Growing? Available online: https://www.brookings.edu/blog/africa-in-focus/2015/05/04/why-is-the-number-of-poor-people-in-africa-increasing-when-africas-economies-are-growing/ (Accessed on January 5, 2018). Watkins, Kevin; Quattri, Maria. 2016. Child poverty, inequality and demography: Why sub-Saharan Africa matters for the Sustainable Development Goals. Washington D.C.: Overseas Development Institute. Boumphrey, Sarah. 2017. Special Report: The World’s Youngest Populations. Euromonitor International Blog. Euromonitor. https://blog.euromonitor.com/2012/02/special-report-the-worlds-youngest-populations.html (Accessed on January 5, 2018). UNECA. 2015. Africa Regional Report on the Sustainable Development Goals. Addis Ababa: United Nations Economic Commission for Africa. ILO. 2013. Global Employment Trends for Youth in 2013: A Generation at Risk. Geneva: International Labour Organization. World Health Organization. Joint Monitoring Report 2015 Key Facts. Available at: http://www.who.int/water_sanitation_health/monitoring/jmp-2015-key-facts/en/. International Energy Agency. 2014. Africa Energy Outlook: A focus on energy prospects in sub-Saharan Africa. Available at: http://www.iea.org/publications/freepublications/publication/WEO2014_AfricaEnergyOutlook.pdf. Signe, Landry. 2017. “The quest for food security and agricultural transformation in Africa: Is the CAADP the answer?” Brookings. Available online: https://www.brookings.edu/blog/africa-in-focus/2017/10/16/the-quest-for-food-security-and-agricultural-transformation-in-africa-is-the-caadp-the-answer/. International Labour Organization. Social Protection in Africa.” Available online: <http://www.ilo.org/addisababa/areas-of-work/social-protection/lang--en/index.htm> (Accessed on January 5, 2018). U.K. Department for International Development. 2011. Cash Transfers. London: UKaid. Available online: http://www.who.int/alliance-hpsr/alliancehpsr_dfidevidencepaper.pdf.